Art deco engagement rings are a visually striking high contrast style that practically radiates confidence. The style, which ranges from art and fashion to architecture, is characterized by linear symmetry and bold or abrupt contrasts, colors, and patterns. The striking geometric designs and shapes embody both elegance and vintage glamour, as well as originality, modernity, and functionality. This style began in Paris in the mid 1920s and flourished worldwide until World War II when the world was forced to shift towards more pragmatic considerations. Accordingly, art deco engagement rings can feature a range of stones with bright and colorful designs set in bold geometric shapes. 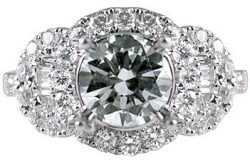 Unlike other engagement rings, the art deco style does not always favor diamonds. Although diamonds are still the most the dominant gemstone in many art deco jewelry, other colorful gems such as emeralds, rubies, and sapphires are also featured promontory in many art deco engagement rings. 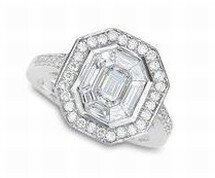 Because of the history, art deco is considered a 'retro' or antique engagement ring style. This does not mean the rings themselves are genuine antiques. 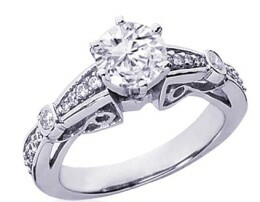 If you can afford one, it is quite possible to obtain a genuine antique engagement ring. However, most art deco engagement rings on the market today are either replicated from an original (and perhaps enhanced) or else brand new and unique designs that are directly based on the art deco style. The ring must always match your woman's (or man's) unique personalty and style. This is the most essential point for buying engagement rings, if not jewelry in general. There are many different engagement ring styles and it is an unavoidable fact that art deco engagement rings are not ideal for every woman. On the other hand, for the right women, there is really no other style that can compare with the strong and bold style of an art deco engagement ring. Whether you are a woman looking for style tips to choose your own ring or a man looking to surprise your woman with an art deco engagement ring, the following tips should help you decide if this style is right for you. Confidence: Someone confident in her own personality and style is unconcerned about what others think or see in her because she already knows she's a great person! More than anything else, the striking contrasts, shapes, and colors of an art deco ring exhibit an aura of confidence and unshakable personality. Outgoing: An outgoing and talkative personality is the life or a party and not afraid to be the center of attention. This is the opposite of timidity and shyness. The bold designs and contrasts common to art deco engagement rings will perfectly complement an outgoing personality. The ring itself will no doubt bring many complements and be the source of numerous conversations. Originality: As with confidence, a sense of originality and uniqueness matches perfectly with the art deco style. You are yourself. Authentic and unique. There is no one else in the world with your character, your personality, and your style. The art deco ring, a rare and unique style in itself, is simply an extension of this attitude. Keep in mind that within this style there is a wide range of diversity and subtlety. A woman does not need to fit exactly into all the above categories to be a good match for many art deco ring styles. Perhaps these are one or more personality traits she would like to embrace or maybe an art deco engagement ring just fits in with the rest of her style.